I love schoolboy blazers. I have this one in Navy as well. I wear them a lot in the Fall and Winter. They make a great thing for a Christmas gift. I got mine for Christmas from my parents one year. I hope you all have a great weekend! Love this look specially the silver heels. I love a good school boy blazer! 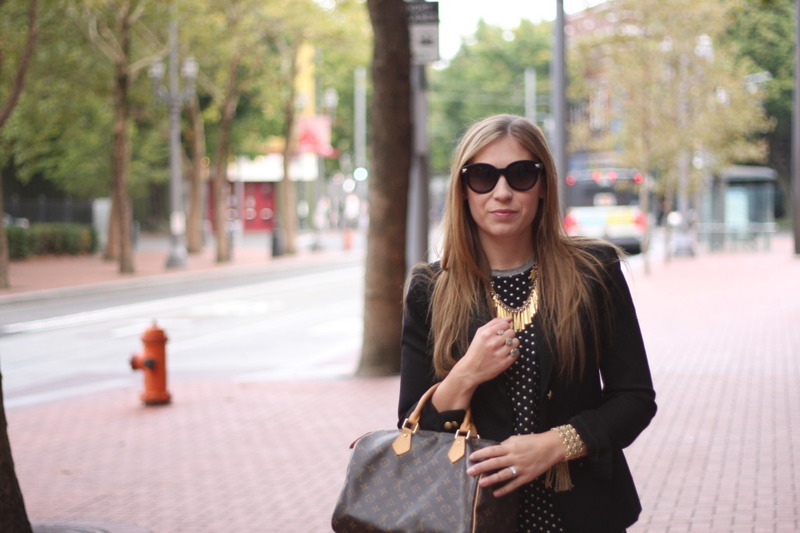 This one is gorgeous and I love it with the polka dots and gold! You are always just so polished — I hope I can get there one day! Lol. You look lovely! 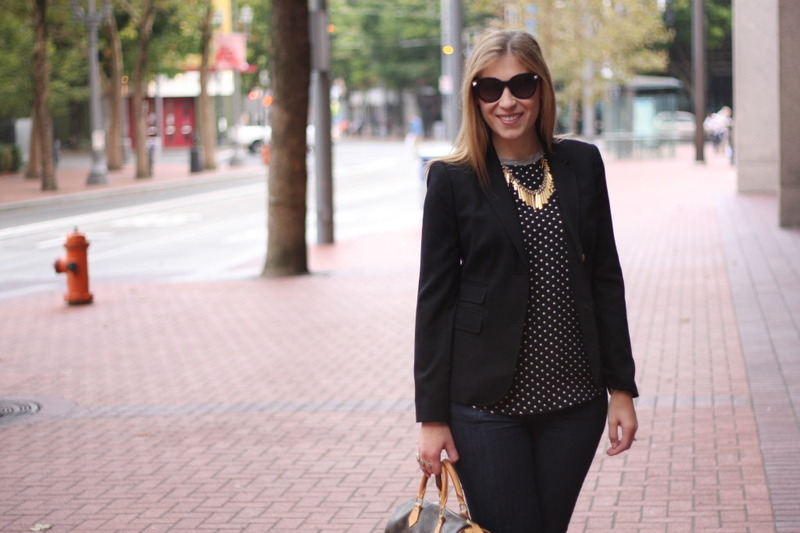 Loving that blazer with the polka dots! Too cute! I agree that the school boy blazer is one of the best pieces out there! I wear mine all of the time! I love your accessories here, especially your necklace and heels! Love, love, love your schoolboy blazer! And I love it even more with that polka dot blouse! Perfectly polished! You look so chic and sophisticated! Loving this blazer and I really love those shoes!! That blouse is great paired under it as well! So chic! 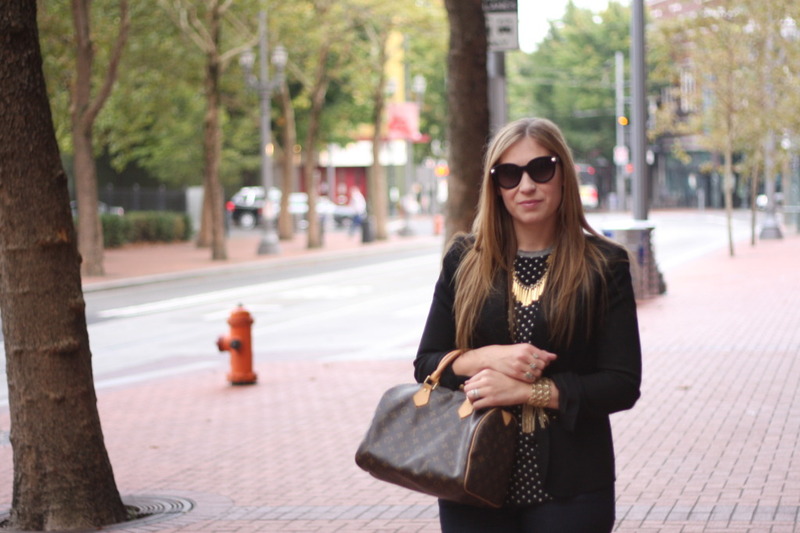 I love the polka dot blouse underneath! That necklace completes the look perfectly! Love this chic look and your necklace is gorgeous! OMG I have that blazer in like 4 colors. THE BEST! Love your elegant outfit! So polished and very well put together. Great look for work and play. Love the heels! You are so chic. The cut of that blazer is perfect! I love the pumps!! You look amazing! 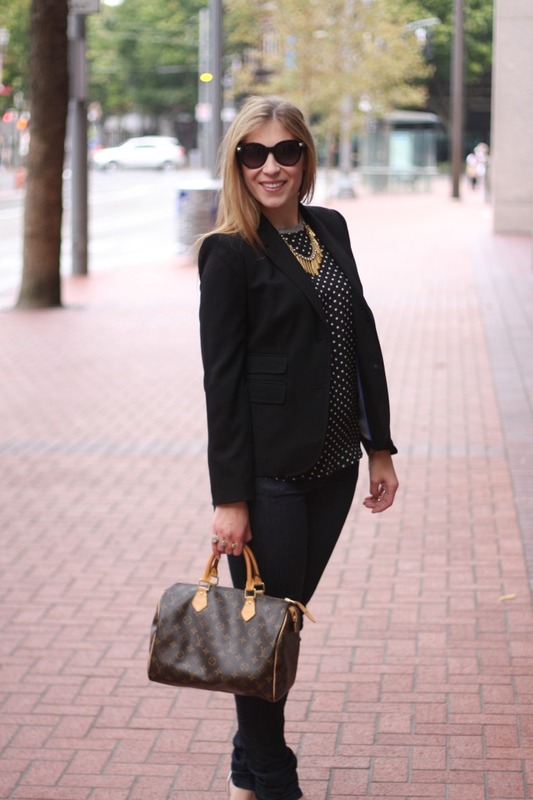 The schoolboy blazer is such a versatile piece that pair well with so many great outfits! Love your heels too! great outfit,i love your charming smile.